I have to admit I've been holding out on you guys...about two months before we moved I got my hands on some permanent matte vinyl. I was dying to try it because hello - permanent matte 651 only comes in black and white and well sometimes you just need pink or teal or lavender or all the colors!! I packed this bundle of Scraft Artise permanent vinyl into a box (marked: Open First!) and ...let's just say it was one of the first things I cut when we finally got settled here in the new house. So I'm thrilled to finally be able to share this oh-so-hard-to-find but much-desired permanent adhesive vinyl with you!!! 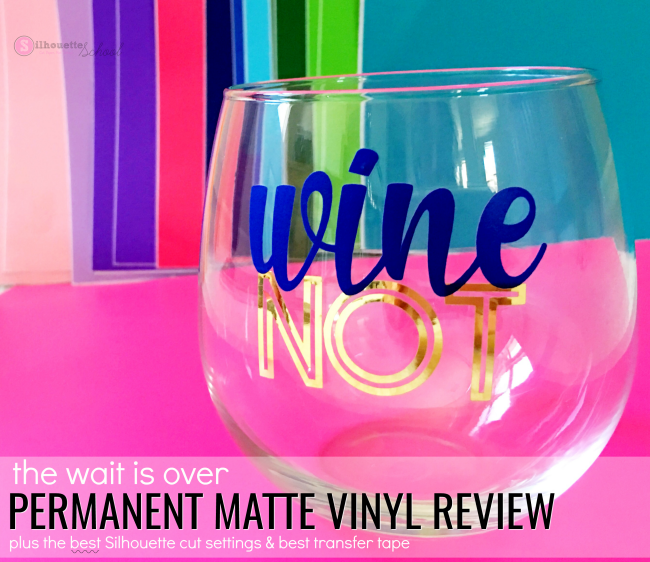 Meet Scraft Artise matte permanent vinyl which is filling a little niche in a big way in the crafting world (including on Amazon!!!). Now you know guys know I love Oracal - it's my go-to brand of adhesive vinyl - but try finding permanent matte vinyl in anything other than black and white. Not gonna happen. So a crafters gotta do what a crafters gotta do and for me that's finding some quality permanent matte in a rainbow of colors! You guys I found the pot of gold and the rainbow. Now if there's one thing I know...it's one thing to find a product everyone's been look for, it's quite another to test it out and see if it actually works the way it claims and the way us Silhouette crafters want (and need) it to. How does it cut? How does it weed? Does transfer tape pick it up and release it easily? And the biggie...is it truly permanent? Ya know...can it withstand the dishwasher? Shhh don't tell anyone I put my vinyl in the dishwasher! The answer to all of these questions, I am happy to report, is YES! That's why I am now sharing this relatively new brand of permanent/outdoor adhesive matte vinyl with you! Okay so let's talk specifics. I intentionally picked a pretty challenging design and application surface to cut with my Silhouette machine to see how the vinyl would work. 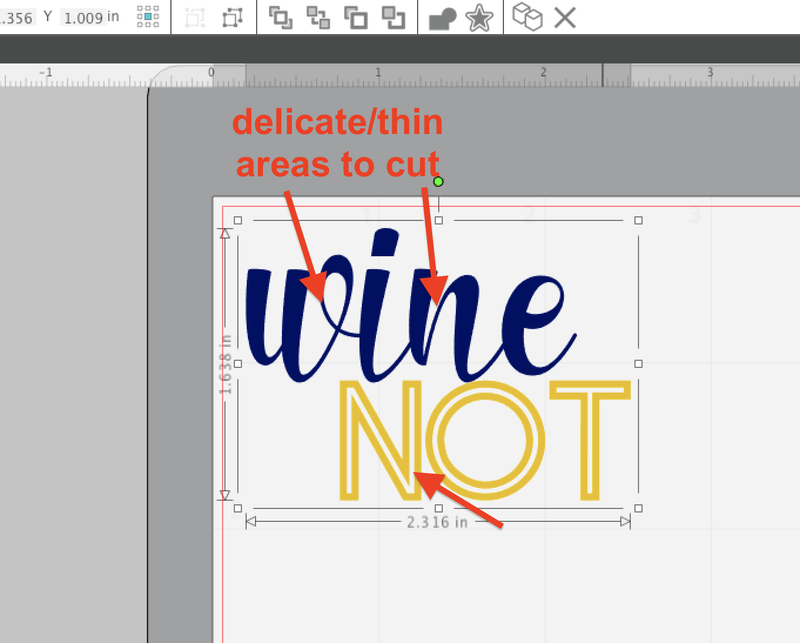 You can see in the screen grab of Silhouette Studio 4 below, there are some pretty delicate and small areas of the design which can sometimes tear while cutting with your Silhouette CAMEO or Portrait if you're not careful. Even if they make it through the cut unscathed, weeding them can be a challenge. If you've ever put a thin vinyl design on a glass (or anywhere), you know that peeling can occur from use, handling, and washing especially in those narrow areas where there's not a lot of surface area and therefore not a lot of adhesive. So with my design ready to go in Silhouette Studio, I picked the matte navy permanent vinyl and the gold permanent vinyl for a two tone look. 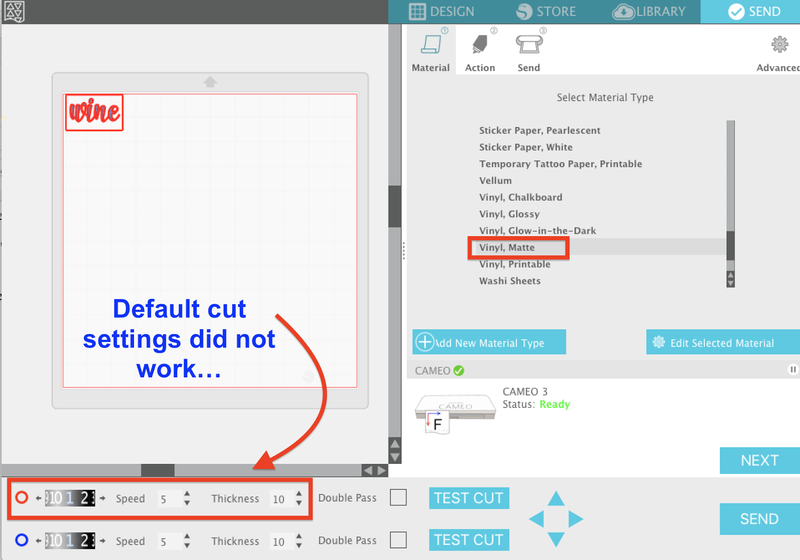 The first time I cut the Scraft Artise permanent vinyl I used the default cut settings for Matte Vinyl in Silhouette Studio V4 and it did not cut through. These settings worked perfectly with the Scraft Artise matte permanent vinyl cutting through and weeding cleanly and easily after being cut with my Silhouette CAMEO 3 and Autoblade. It's super important that you use your scraper to burnish the vinyl and transfer tape well in order to successfully pick it up. I applied my vinyl to a stemless wine glass, making a few snips in the tape to help apply to the rounded surface. Now is when you have to be patient. Before you use the glass or wash it - wait!!! Wait 24 hours to let that adhesive cure. After waiting I washed the glass by hand with a soft sponge, soap, and water with no problems. Then I put it through the dishwasher (as a test!) a couple of times and it turned out perfect with no lifting or peeling. Please note this adhesive vinyl, like all, is not considered dishwasher safe. 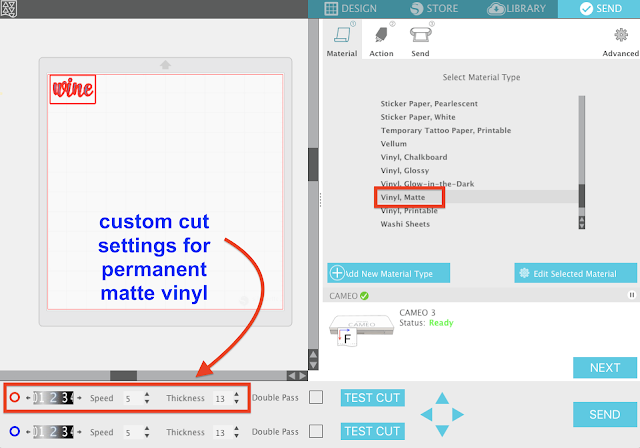 A couple of notes about Scraft Artise Permanent Matte Vinyl...right now it only comes in 12x12" sheets. You can buy a single sheet, a 40 pack or 20 pack assorted bundle of all of the colors, or a bundle of all the same colors. The price is a little higher per sheet than removable matte vinyl or glossy permanent, but like most specialty vinyls - glitter and patterns - it's not surprising. But...if you get the 40 pack of variety colors of Scraft Artise permanent matte vinyl you can get it for what comes out to about .62 a sheet and free Prime shipping. And speaking of shipping, their vinyl is shipped flat with a piece of stiff cardboard so it doesn't get wrinkled in the mail and will stay flat while you're cutting both with or without the cutting mat (although I always recommend a mat). PS... In case you missed my Facebook post the other day, Scraft Artise is also hosting a huge giveaway in July. Like Silhouette CAMEO 3 and $100 Amazon Gift Card huge. I love how your project turned out. Thanks so much for your review to help me narrow down my choice on vinyl selection. I love the gold, was which brand was that? Love the glass! 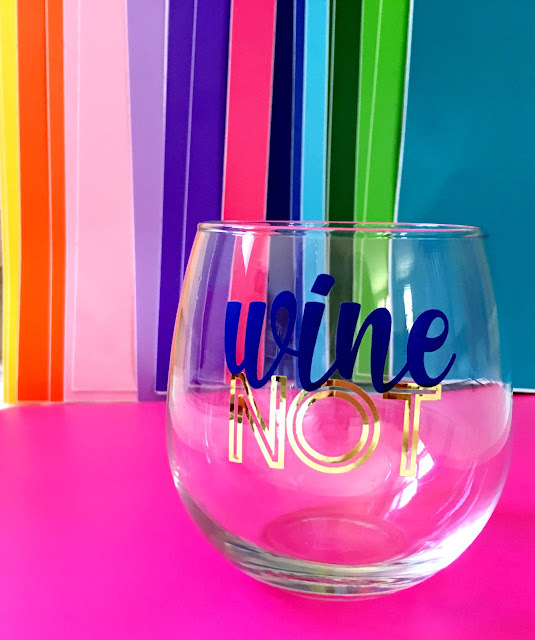 What font did you use for the word Wine? Has your matte vinyl continued to hold up?!? I got my first order in today, and I am excited to give it a try! I have fallen in love with matte vinyl and I was so excited to see your post and find lots of color options!